Thank you for considering the Beus Center for Law and Society (BCLS) as the host site for your upcoming event. 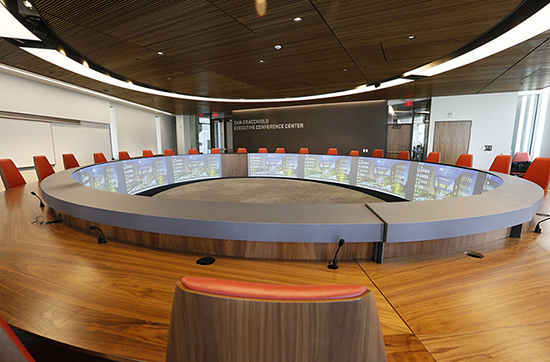 We are excited to be a part of the Arizona State University Downtown Phoenix campus. The state-of-the-art, 280,000 square-foot facility is specifically designed to increase the public’s understanding of justice through ongoing events and displays. The BCLS building is home to the Sandra Day O’Connor College of Law at Arizona State University (ASU Law), the ASU Alumni Law Group, the Sandra Day O’Connor Institute, the McCain Institute for International Leadership, and the Lincoln Center for Applied Ethics. Several unique venue options can be tailored to fit the needs of specific event requirements. Please read the following event guidelines and rates carefully to determine if the BCLS is the correct venue. Events should have a legal or judicial-related focus. Priority will be given to events with related topics. Priority will be given to events that offer engagement opportunities for College of Law students. All events are scheduled in the order they were requested and space is not guaranteed until necessary agreements are signed and deposits are paid. Event requests must be received at least 30 days in advance. All events must be booked through ASU Law Event Coordinators. All event requests are reviewed and approved by BCLS Events Committee and Leadership. Events should take place during regular building hours including setup and strike times: Monday through Friday 7:00 a.m. – 6:00 p.m. Any afterhours events will incur an additional $100 fee. BCLS is closed on Saturday and Sunday. Weekend rates will be incurred. No events on Sundays. BCLS reserves the right to deny weekend facility usage if the requesting organization has less than 30 participants. A 50% non-refundable deposit must be received 14 days prior to the event. Any additional fees associated with the event must be received at least 2 business days prior to the event date. Third party events cannot be scheduled on student reading days or during finals. These dates vary but typically fall within the first two weeks of December, the last two weeks of April and first two weeks of May. Conferences that are longer than one day and/or require breakout rooms, will only be accommodated during fall, winter and spring breaks or when student presence is at a minimal. Two, 1 hour walkthroughs (initial and final) are included with standard room rates. Additional walkthroughs are subjected to further fees. For ASU Colleges and Schools looking to reserve University Classroom BCLS 140, please email rooms@asu.edu. BCLS does not provide event support for University Classrooms. Under no circumstances can events be hosted on University holidays. ASU Law offers a full range of event services, as well as, onsite Event Coordinators that are available to assist with needs to ensure event success. Event Coordinators are experienced at planning and managing a wide range of activities and can help navigate through building issues, fire and safety guidelines, permitting, power sources, and provide assistance with video, sound, lighting, computers and more. “These rates apply to not-for-profit entities or other entities that are not generating any revenue from use of the college facilities. For those for-profit entities that are generating revenue from use of the college’s facilities, the rates are presumptively at minimum twice the rates posted above and may require special negotiation”. 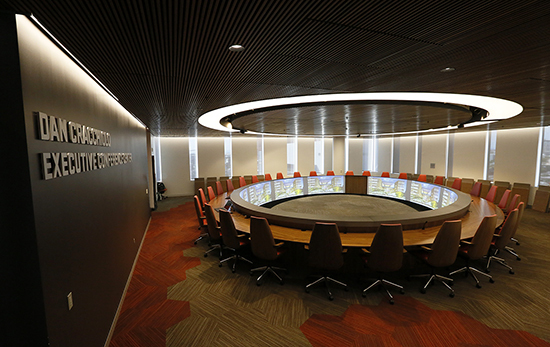 A variety of audio/visual needs can be accommodated in the BCLS depending on the space being utilized. Rooms 544A and 544B can be combined so that both screens/projectors can be utilized for 1 presentation. Please work with your event coordinator regarding specific audio/visual needs. BCLS does not accommodate video recording or live streaming of third party organization or ASU affiliated events. If other requests exceed the basic capacity of the booked room, third party audio/visual suppliers are allowed to provide appropriate accommodations at cost to the hosting organization. For any audio visual equipment not accommodated by the BCLS, additional items may be rented through Video West. Below is the link to ASU’s approved catering vendors. It is the responsibility of the client to organize catering. Please inform your event coordinator of all catering plans. Alcohol can be permitted at events hosted at the BCLS. Please inform event coordinators if there is intention to serve alcohol. IN ORDER TO SERVE ALCOHOL, EVENTS MUST BE FREE OF CHARGE TO GUESTS AND THE BAR MUST BE HOSTED (i.e. open bar). First, approval must be granted by the BCLS Event Committee. Once approved by BCLS, the event coordinator will assist in filling out required University Alcohol Permit forms. Final approval comes from the ASU Police Department. There will be a $50 non-refundable processing fee for alcohol permits. The official address for the BCLS is 111 East Taylor Street, Phoenix, AZ 85004. The main entrance to the building is located off 1st Street in between Taylor and Polk. Parking at the Arizona State University Downtown Phoenix Campus is extraordinarily limited. Cost and location of visitor parking varies daily and is contingent upon event timing, number of attendees and the volume of classes and events taking place on any given day. Please work with your event coordinator on specific parking options. Any parking reservations for 20 or more guests will incur a fee of $40. Click here for a map and full directions. All events must adhere to the University’s Fire Safety Policy. An event can be interrupted or possibly canceled should fire safety violations exist. Event venues must have clearly identified fire exits and occupancy limits must be enforced. Should a fire alarm sound, house lights will be turned up, if necessary, and all participants will be instructed to leave the area or to respond as directed by fire safety or fire department personnel. ASU is a tobacco-free campus. Smoking, e-cigarettes, vape pens, and illegal drugs of any kind are prohibited in all campus facilities. No painting or spray-painting in the facility or on campus grounds at any time. Duct tape, thumbtacks, or any other strong adhesive is not allowed on any surface in the facilities. DO NOT nail anything into walls, floors or ceilings. All materials must be cleaned up and removed completely upon event conclusion. Any damage to the space or need for excess cleaning caused by the client will be billed directly to their organization. No glitter or confetti is allowed in any event space. The use of glitter will result in an automatic cleaning fee. Client is not permitted to alter the space in any way – i.e. removing or relocating plants, art, or installations that are fixtures in the space. Client should not stand on furniture, including chairs and/or tables. Groups should not drag furniture across the floor. Either lift or ask for assistance from event staff. Event spaces must be left in the same condition as they were found. If the room arrangement is altered in any way, the client must return the room to the original configuration at the conclusion of the event. Fire Exit Signs cannot be covered under any circumstances. Exit and Entrance doors as well as hallways and walkways cannot be blocked under any circumstances. All cords and cables must be taped down. No use of fire or flame can be used with the exception of catering needs by an ASU Approved Catering Vendor. No signage can be taped or attached to BCLS structures. Signage should be independent and on easels, or stand-alone banners. No signage is allowed outside of the reserved event space, including the doors leading into the event space, without prior approval. Please submit a signage plan to your event coordinator seven days in advance. 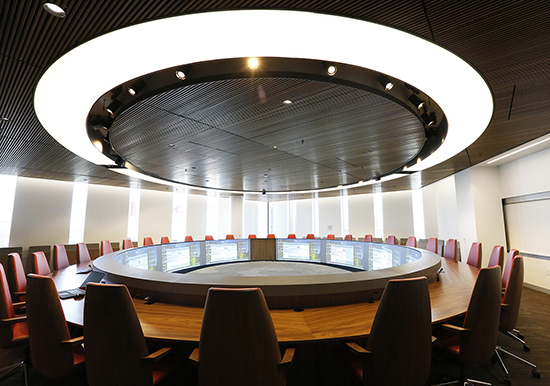 The BCLS has a selective number of tables and chairs available for the use of events. Please refer to the below chart regarding inventory. All items are subject to availability. 90″ x 132″ Rectangular Various Quantities are contingent upon the volume of events taking place at a given time. Linens are not always available. There is a $6.00 per linen charge for laundry services. For any items not accommodated by the BCLS, additional items may be rented exclusively through Classic Party Rentals. Prior to contacting, rental items can possibly be arranged through the caterer.